Summary: Great book – clear explanations, useful example code and a friendly, easy-going writing style. One of my favourite academic books ever! Machine Learning can be a difficult topic – as I found out when taking a Masters-level machine learning course this year. It can become very mathematical – particularly when dealing with complicated areas such as Support Vector Machines – and it is very difficult to pitch a university lecture course at a level where all of the students can understand it. Unfortunately, in my course I was one of the students who didn’t really understand the lectures particularly well…but this book saved me! In fact, it was so well written that I was reading it in bed at night, and staying up late to finish the chapter! I firmly believe that fields such as Machine Learning and other practical computing topics (such as Computer Vision, Statistics, Programming etc) should be taught using practical examples and practical teaching sessions wherever possible. Also – for all but the most complex topics – full algorithms should be provided, and implementations in appropriate programming languages shown. 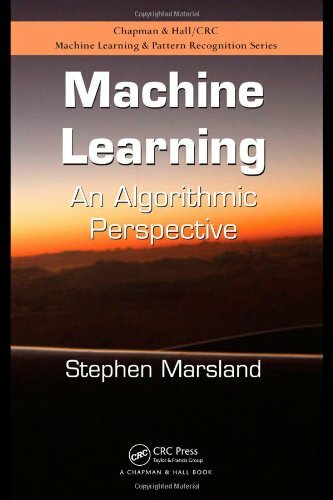 This book definitely fulfils this – showing detailed algorithm explanations for all of the algorithms considered (apart from Support Vector Machines, which the author decided – sensibly in my opinion – were too difficult to cover in full detail), and implementing them in Python versions. Parts of the python code are shown in the book, and all of the code is available online. The explanations and motivations for the techniques shown in the book are brilliant – both easy-to-read and comprehensive. Mathematical explanation are clear – with ‘big picture’ explanations given in textual form for those who want to skip the detailed maths – and diagrams are well-chosen and easy to understand. Furthermore, sensible examples are given for the uses of machine learning – ranging from standard datasets like iris, to more unusual examples like ozone layer depth prediction. The book covers most of what you’d need for an introductory Machine Learning course, starting with perceptrons, before moving to multi-layer perceptrons, radial basis functions, support vector machines, decision trees, unsupervised techniques and genetic algorithms. The book also covers introductions to probability (including Bayesian inference), dimensionality reduction (including PCA and LDA) and optimisation techniques. The wide range of techniques covered makes this useful not just for machine learning students: genetic algorithms, dimensionality reduction and optimisation have many applications in other fields. This is a shorter review than many of my reviews, as I really can’t find much to fault with the book. It’s great. My advice is, if you’re interested in this topic, need to learn it for a course, or think you’ll want to use Machine Learning techniques in your work then buy it – you won’t regret it!